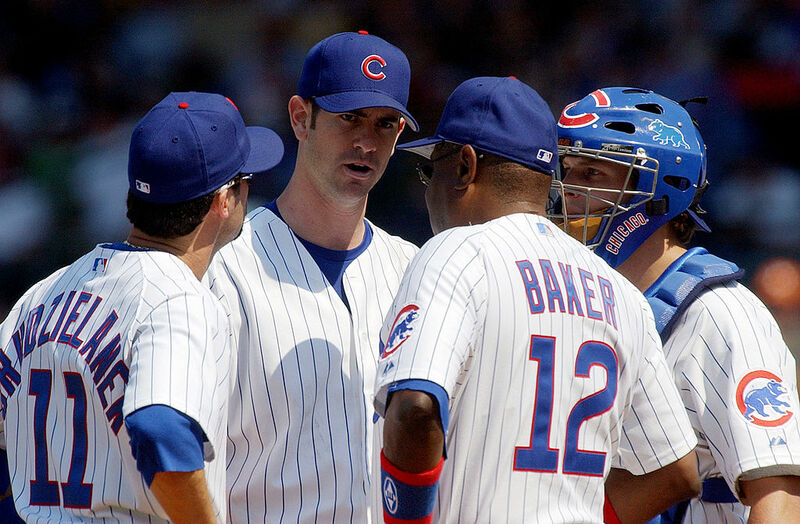 In 2003, Mark Prior looked like the long-term ace of the Chicago Cubs. At the age of just 22, Prior threw 211 1/3 innings for the NL Central champion Cubs, striking out 245, walking 50, and pitching to a 2.43 ERA. He was an NL All-Star, and finished third in Cy Young voting behind Eric Gagne and Jason Schmidt (a pair of players whose careers also peaked in that 2003 season). That was the best season of Prior’s career. He struggled with injuries from there on out, making 21 starts in 2004, 27 in 2005, and just nine in 2006, what would end up being his final career in the majors. Prior spent time with the Padres, Rangers, Yankees, Red Sox, and Reds, but never made it back to the majors. During that 2003 season, Prior threw at least 100 pitches in all but four of his 30 starts. He broke the 120 pitch mark nine times, and even cracked 130 three times – a high workload for a 22-year old that was drafted second overall in the 2001 MLB Draft. Prior’s hefty workload continued into the Postseason for Chicago, when he made three starts and threw at least 116 pitches in all three of them. Prior was the starting pitcher in Game 6 of the NLCS that year, the game where the Cubs famously blew a 3-0 lead in disastrous fashion in the eighth inning to the Florida Marlins. After retiring the first batter of the inning, Prior allowed five straight men to reach, capped by a two-run double by future Cub Derrek Lee to tie the game at three. Prior’s career was never the same after that, and many blamed his manager in 2003, Dusty Baker, for turning Prior’s arm into raw meat and running him out to the mound far too often. One of those people is *not* Mark Prior. In a piece for The Cauldron, Prior reflects on his career, a week shy of ten years since his last appearance in his majors. He specifically talks about the criticism leveled towards Baker, and absolves him from any blame. Others — mostly Cubs fans — still blame my manager, Dusty Baker, for the series of injuries that derailed my career. They believe that he overused me in 2003 and blah, blah, blah. Only, here’s the thing: I don’t blame Dusty for what happened to me. I wouldn’t change a single thing that happened during that season — beyond us failing to bring a World Series Championship to Chicago, of course. No matter how many pitches I threw, I never asked to come out of a game — doing so would have been unthinkable. Dusty was hired to manage each game like it was his last. And over the course of a season (or even multiple seasons), that meant an endless series of decisions — especially when it comes to balancing pitcher workloads against the need to win games. Ironically, this is part of my job with the Padres now — the job pitching coaches at all our affiliates have — and it’s not an easy one. Like anything else, you do the best you can. Prior also points to another pair of incidents, one before the NLCS game and one years later, that likely affected his career negatively. Also, people seem to forget two major events that significantly influenced my injury history: 1) the collision I sustained with Marcus Giles in 2003; and 2) the Brad Hawpe line drive that broke my elbow two years later. I’m no doctor, but I can’t help but feel like those incidents muddied the waters in advance of my subsequent shoulder injuries. That collision could’ve stretched my shoulder capsule out without my ever really knowing it. The collision with Giles occurred on July 11th, 2003. Prior missed less than a month of action, threw at least 100 pitches in ten of his 11 starts after the incident, and was dominant, striking out 95 and walking 16 over 82 2/3 innings with a 1.52 ERA. The Cubs needed Prior in the second half – they fell to 46-46, third in the NL Central, after that game. Incredibly, he stayed in the game for another two innings after the collision. The Hawpe line drive that broke Prior’s elbow came on May 27, 2005. He missed less than a month of games, and in 18 starts after the injury, he struck out 126, walked 41, and pitched to a 4.07 ERA in 108 1/3 innings. In those 18 starts, he “only” threw at least 100 pitches in 13 of 18 starts. He made nine starts in 2006, Baker was fired after the season was over (and has won a total of two playoff games in nine seasons since the 2003 collapse), and Prior never again pitched in the majors. Is Dusty Baker to blame for the downward spiral? I don’t think it’s completely on him – the Cubs training staff should have done more for Prior after those two brutal injuries. But Baker probably should have handled him a bit more gently after his return on both occasions – gearing Prior up to a full workload almost right after his return was ridiculous and silly. That being said, Baker and the Cubs were trying to win a World Series, and if that Game 6 collapse hadn’t happened, who knows how we’d end up looking back on Prior’s career. Baker does appear to have learned his lesson, though – Stephen Strasburg’s season-high in pitches under Baker with the Nationals this season is just 114, a mark Prior cleared in 16 of his 30 regular season starts (and all three Postseason starts) in 2003.